September | 2014 | Loch Lomond Livestock Ltd.
With the arrival of fall comes fall work. Farmers are hard at work (whenever the rain doesn’t stop them) combining grain and getting stuck, and unstuck. 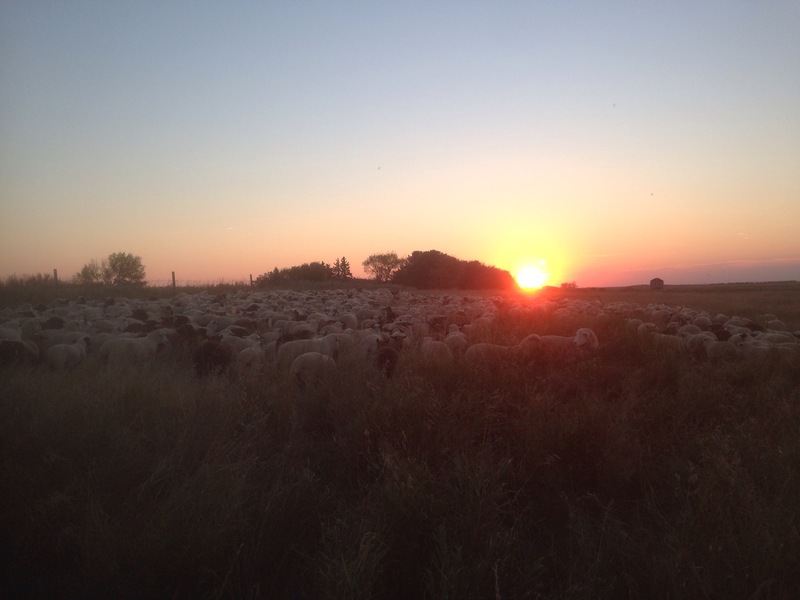 Sheep are starting to move off the pasture, and this week we brought the flock home to wean lambs and vaccinate ewes. Because they were more than 2 miles away, I decided to move them over the course of the day, moving about a mile and a half in the morning to a patch that was cut for hay in July with good alfalfa regrowth. 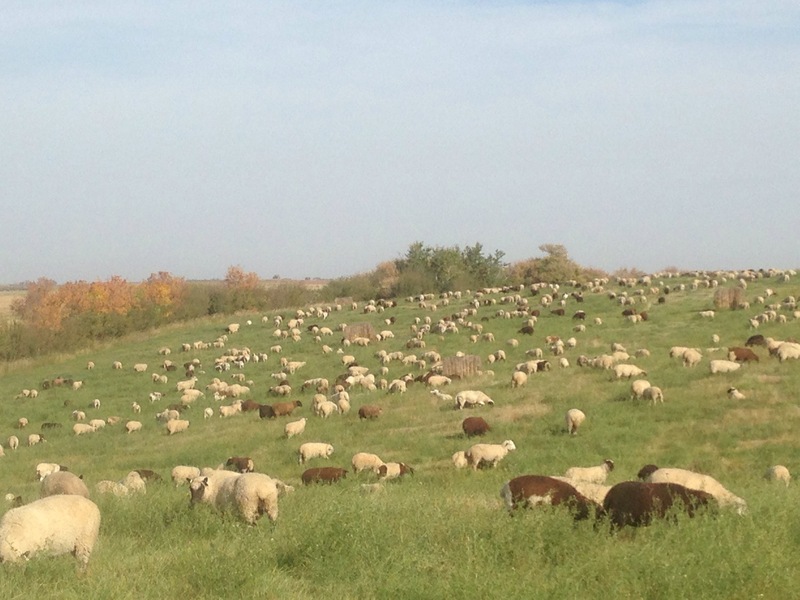 As they spread out over the field, I took some time to enjoy the blend of fall colours of leaves on trees, ripened grain crops and still green grass to the harmony of the sheep munching away on the tasty morsels of grass and alfalfa. These moments, surrounded by nature, livestock and dogs are wonderful reminders of why it is we choose to do what we do. The sheep were obviously quite happy here, but as their natural tendency is, they began to drift towards the yard later in the afternoon. With some help from the dogs they came in at sundown. Reluctantly, I came to the decision that it was time to move a couple of the guard dogs to new homes. Chloe had never been properly bonded with sheep, so was always back and forth between the yard and the pasture. She just didn’t have the desire to stay with the sheep and because she was the dominant female she would often bring one or two males with her. I was frustrated and worried she was going to teach more dogs to come and go as well, so decided that I needed to find her a new home before it got to that stage. She has gone to a young family with 2 kids, a couple horses and pester-some deer around the yard. She will get to be around the yard and get lots of attention and hopefully will help them with their deer problem. Charlie has always been a funny dog. He has shown moments of brilliance but is not a tight flock dog and is often sleeping somewhere where the sheep are not. He also has been showing up in the yard regularly. He is the low dog on the totem poll so it may be he just doesn’t have the confidence to do the job. Charlie has also gone to a family with a couple kids that are starting to feel the wary presence of coyotes getting close to the yard. Charlie loves kids and people so I think this will be perfect for him, room to run and work while being able to spend days sleeping in the shade and playing with kids. It was hard to see these two go, they’ve been a presence on the farm for a few years and despite only seeing them once or twice a day, I’ve grown somewhat attached. I take comfort in knowing that they have gone to good homes and after the adjustment period we will all be a little happier. In such a dry country, crossing water is something we don’t normally have to do. Usually sloughs dry up in the spring and we can go through them, or around in the case of larger, more permanent water bodies. But this year has been very wet and water is lying or flowing in areas where it rarely has before. This meant that to get to a good portion of our sheep pasture we had to cross some water. 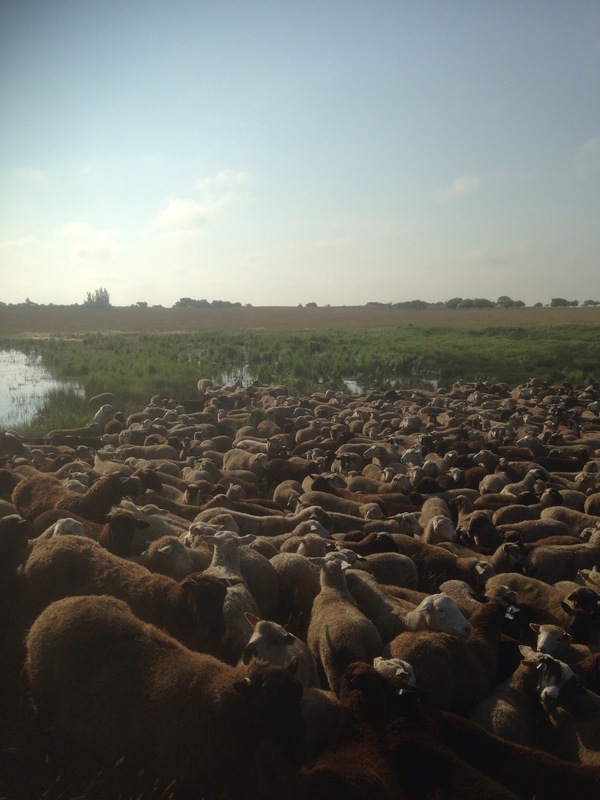 This slough is only about 6 inches deep and the deepest point, so no problem for sheep to cross – if they want to. ‘If they want to’ is the critical piece of this sentence, unfortunately for those of us who want to control our animals movement. The first time we crossed the slough, there was enough dirt sticking above the water to convince the first sheep they could make it, and the rest followed, as sheep do. The second time, we had just gotten through a rainy spell and the water was higher so it was much more of a challenge. 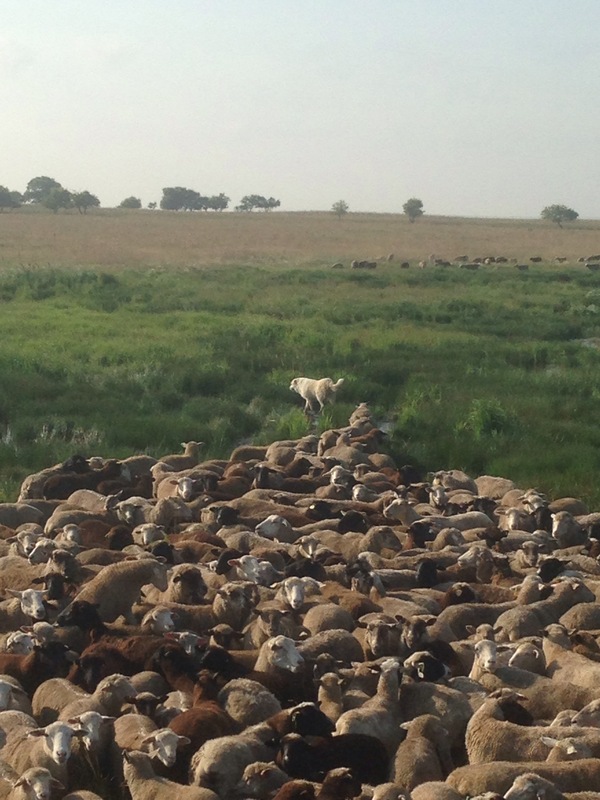 It took us over an hour to convince them to cross- even though the lead sheep were standing in water most of the time! I even managed to grab a ewe and steer her across the water at one point, with hopes of the rest following. The rest of the ewes took no notice of this sheep making it through, and she promptly turned around and waded back over with the rest. Eventually, once man and dog were frustrated and tired, the sheep decided to take the chance and walk across. The next time across, the sheep showed signs of balking again, so I grabbed the pail of dog food out of the side-by-side and shook it like a pail of grain. An old ewe sure liked the sound of that and followed me across, followed shortly by the rest. Once more we had to cross this same slough (it separates some of the pasture from another, as well as from the yard, so it really is inconvenient!). 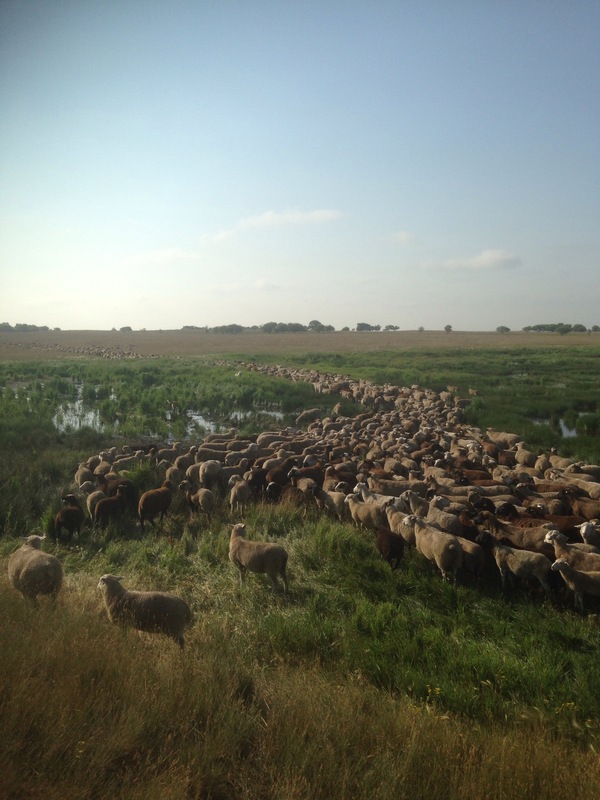 This time the sheep had been in a pasture that the slough runs through, so some were on the right side, so I thought, they will see those other sheep and go straight over! So Jack and I gathered the sheep and steered them towards the shallowest part of the slough where there were some tracks. Well the sheep looked over at those other sheep as if completely stumped by how they could get over there. It seemed that this was not going to be as easy as I thought. Then Alice the guard dog started to head across the slough. And wouldn’t you know it, the sheep followed. They didn’t take the shortest or shallowest path through the slough but the one that Alice showed them was safe.